Trinidad, West Indies. Sargassum covers the beach. Captions: A Tale of Two Beaches: Tompire Bay, NE Trinidad; By John Weber, William Neal & Jeanette Arkle. Photo courtesy of: © Jeanette Arkle. In retrospect, 2011 was just the first wave. That year, massive rafts of Sargassum—a brown seaweed that lives in the open ocean—washed up on beaches across the Caribbean, trapping sea turtles and filling the air with the stench of rotting eggs. But a few years later “it came back worse,” Oxenford says. 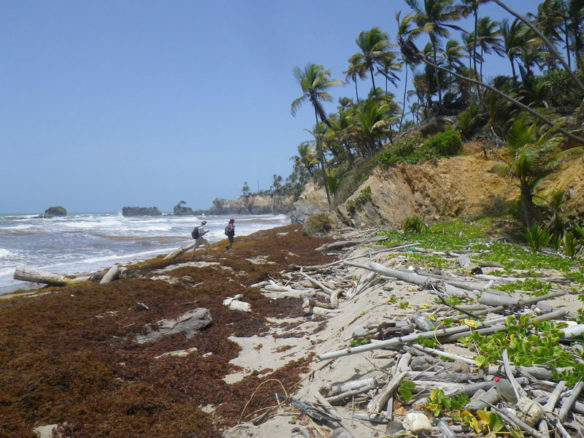 Now, the Caribbean is bracing for what could be the mother of all seaweed invasions, with satellite observations warning of record-setting Sargassum ​blooms and seaweed already swamping beaches. The Barbados government declared a national emergency on 7 June…. 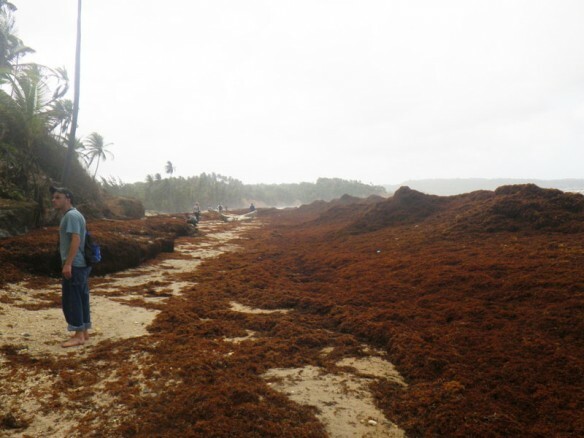 Sargassum is invading the beaches of Martinique island, French West Indies. Trinidad, West Indies. Giant wrack-line of Sargassum. Height here exceeded 2 m. The wall was definitely a barrier to nesting turtles. Captions: A Tale of Two Beaches: Tompire Bay, NE Trinidad; By John Weber, William Neal & Jeanette Arkle. Photo courtesy of: © Jeanette Arkle.